You should be able to "clean up" your house and make in presentable in 20 minutes. At least that's what I thought 4 years ago. I am a terrible housekeeper. I fit into the catergory of "all or nothing". I either clean ALL of the house in one day...or I clean NOTHING at all. There's never been a middle-ground for me. This housekeeping journey I've been on since the day Mike and I got married has been a grueling learning experience. Trying to constantly find the right balance. The right methods. I'd see how others did it, and then I try and copy them. And I'd go back to my trusty bad habits. All the while my poor home seemed to suffer near-condemnation. Until today. I was sweeping our hallway. And in that moment, I realized, "I think I've done it!" As I continued to sweep, I further realized that if someone came knocking on my door, I wouldn't feel immediate panic. WHAT JOY that is to feel that way! Not that my house is white-glove clean. (it's not) But that it's presentable. There are toys on my floor, but not ALL the toys. There are dishes on one side of my sink, but they are CLEAN. My bed is made. And my bathroom smells pretty. How did I accomplish such a coveted circumstance?? It's taken a lot of work. And I have to PURPOSE to do the following things whether I "feel" like it or not. Even the Bible says in Hebrews 12:11, "For the moment all discipline seems painful rather than pleasant, but later it yields the peaceful fruit of righteousness to those who have been trained by it." I don't clean my house to make it PERFECTLY clean and PERFECTLY presentable in one exhausted attempt. I MAINTAIN my home so it EASILY stays clean and presentable. And I LEARN to be OK if parts of my house still need some "sprucing up". I LEARN to be satisfied in what I have done rather than be dissatisfied with what I haven't done. 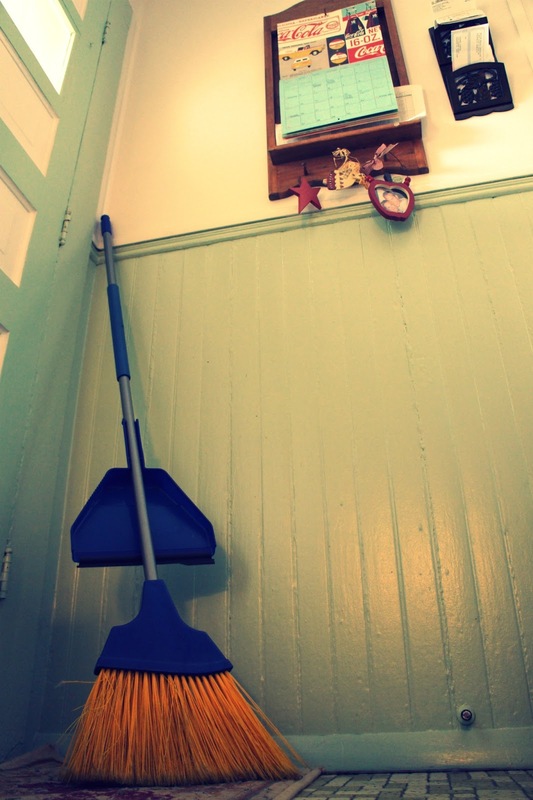 You should be able to "clean up" your house and make it presentable in 20 minutes. My additional hope is to teach my daughter at a young age this idea of "maintainence", of doing one big task daily. I pray that when she gets married, the transition of becoming a homemaker will be seamless! And she will be able to find the JOY that can be found in doing these tasks so much sooner than I was able to! May her "discipline" in these areas happen while she is still my daughter rather than learning them too late. Dear Lord, may it be so. What tips/methods have YOU found to be helpful in maintaining your home?